What is the best artwork ever to appear within the pages of 2000AD? A point that many people will argue about until the thrill suckers come home, but in my opinion it was achieved between Progs 352 and 360. The artist was Mike McMahon, the story 'Sky Chariots' and written by Pat Mills when his tales of SlÃ¡ine Mac Roth were as charged with earth magic as SlÃ¡ine himself. 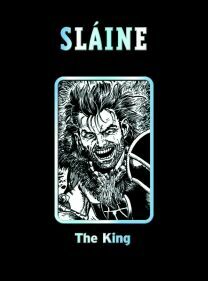 Titan's Deluxe Edition, SlÃ¡ine: The King, contains this very story with the edition bound in a hardback cover & slipcase, printed on glossy paper that makes the black and white artwork far more vivid than it ever appeared within the pages of 2000AD. The hardback editions have a look and feel that put them in a class of their own and makes them stand out against the normal Titan Graphic Novels. No matter how good the package, it's the contents that will encourage people to spend their money and SlÃ¡ine: The King has some seminal moments in SlÃ¡ine's history. They will make the old reader remember how great SlÃ¡ine once was and you have to envy any new reader who will get to read these stories for the first time. The first two stories, 'Warriors Dawn' and 'Sky Chariots' are by Mike McMahon, who had radically changed his style from what readers were used to on Judge Dredd to the scratchy tribal realism he used on SlÃ¡ine. Then in complete contrast we have 'SlÃ¡ine The King' and 'He Didn't Think It Too Many' with artwork by Glenn Fabry. To me Mike's work is the definitive SlÃ¡ine but I'd guess that too many a reader it's the realistic and detailed work Glenn produced that encapsulates all the qualities that made SlÃ¡ine one of the greatest 2000AD creations. This Classic Edition also contains a foreword by Pat Mills wrote in November 2001, which adds some insight into the creation of the Warped Warrior and pays credit to Angie Mills for her part in the characters creation. The hardback editions look good, feel good and present the black and white artwork in a way that many readers will never have seen before, but the contents contain some beautifully rendered artwork. This edition is worth its price purely for the 'Sky Chariots' episodes but if you hanker for the days when the warped warriors stories were charged with earth power, with fantastic art and stories where Pat Mills wove a truly magical adventure, then this should take pride of place on your book shelf. It deserves to be read, read and read again as you will never soak up all the magic that these stories contain, no matter how many times you pick this edition up you'll never think it too many.